Max Kruse and Werder are now undefeated in 10 at home (Photo: nordphoto). 2-1! Three points! Fourth home win in a row and 13 points from a possible 15! Werder have been seriously impressive in recent weeks and showed in the game against Frankfurt just how tough it is to pick up points in such a competitive league. Werder however had their fair share of luck but worked hard for 90 minutes to earn that luck. 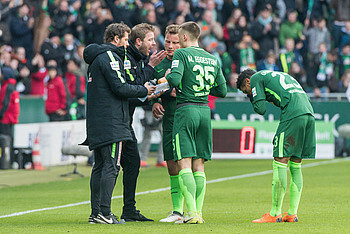 WERDER.DE collected the thoughts from the players and coach after the game. Zlatko Junuzovic opened the scoring (Photo: nordphoto). Always relaying messages: Maximilian Eggestein (Photo: nordphoto). Again showed his class: Jiri Pavlenka (Photo: nordphoto).